Thirty two trainees received their attendance certificates. The Governor of //Karas Region urged newly trained brickmakers, to use their newly acquired skills in development projects, in the region. Hon. Lucia Basson, was addressing the trainees during the Ohorongo Buildit Brickmaking Academy training session at Keetmanshoop on 12 June 2018. Thirty two people received vocational training skills in the trade of brickmaking. Hon. Basson, told the trainees to ensure that they participate in the envisaged housing and other infrastructure projects in the region. “We should do away with the informal settlements in our region and build dignifying houses for ourselves and our people. Use the skills that you received today to address the lack of housing and business infrastructure in the region,” said Hon. Basson. She urged the trainees to take advantage of economic opportunities that are created by the government, especially in the South where there are many development opportunities. anyone else does,” said Basson. The academy is the result of the Smart Partnership between Ohorongo Cement and one of its customers, the Buildit Group, established in March 2017, in support of Government’s development policies, as well as poverty eradication efforts. 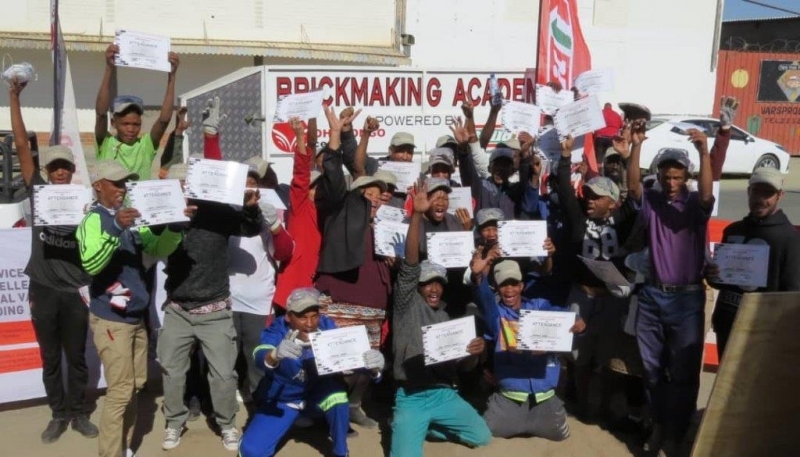 “To help break the chain of poverty, through the brickmaking academy, Ohorongo Cement has committed itself to transfer knowledge and skills to as many Namibians as possible. This we believe, will ensure that all those who received this training can have a chance to share in the prosperity of our country through sustainable livelihoods,” said Hans-Wilhelm Schütte, Managing Director of Ohorongo. During the brickmaking training session, the trainees received guidance on the correct aggregates most beneficial to use during the brickmaking process. Beyond the training, the Ohorongo Technical Team, together with a support team from the Buildit stores, will continue to provide technical assistance and advice to the trainees, in order to ensure the best outcome in the production of high quality bricks. “We also supply them with a booklet which they can take home for future reference,” said Jurgens Nel, one of the Technical Support Team members. As a permanent offset area for their products, the Buildit Group has committed itself to purchase the bricks produced by the trainees, pending adherence to strict quality control measures. “It is the bags of cement sold to our customers that are made into bricks and blocks that keeps the economy growing, and enables people to build better and stronger houses. With an initiative such as this, Namibians would be able to enjoy quality of life,” said Paul Hinson, Category Buyer for the Buildit Group. Johannes Swartbooi from Kutenhaus made the best bricks for the day, and walked away with a bag of Ohorongo Cement to give his newly found skills a kick-start. Lydia Hochobeb from Berseba was ecstatic about the training. “I saw the training on TV and I put in great effort to ensure that I could attend the training. I have been producing poor quality bricks, because I did not know better. Now I will make sure that I will produce great quality bricks and I will also teach others how to do it correctly. I cannot express my gratitude enough, you have been sent from above,” she boasted. Trainees’ selection are done through liaison with the various Regional Governors’ offices. 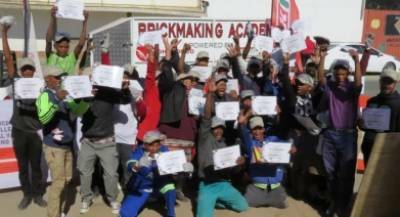 The next brickmaking training will be held in Hardap Region on Thursday. The 14th June in Hardap region and final training will take place in the Omaheke region on 11 July 2018. NOTE: Ohorongo Cement / Buildit are not qualified training institutions and cannot accredit any individual after training has been done. Training is done solely in support of Harambee, transfer of skills & knowledge & job creation in order to empower people.